Snippets of Jack: "Every man worth his salt. And crazy to boot." "Every man worth his salt. And crazy to boot." 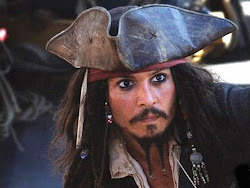 If you look up above this text on the screen, you'll see that here on this awesome website, we are devoted to Captain Jack Sparrow, but we are also devoted to his "totally awesome crew". So, here we are, a post totally about Jack Sparrow's Crew, at least in the context of the people who man the Black Pearl under Jack's command during the movie series. We all know, that of course, the original crew mutinied him and served under Barbossa and some still serve under Jack, but that's not the point. 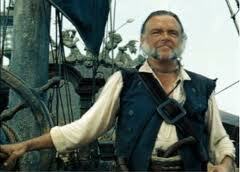 We will be discussing the crew that he picked up from Tortuga with Will and Gibbs in Curse of the Black Pearl. So there is Cotton, who Jack addresses first, standing on the dock of. Jack: "You sailor! Do you have the courage and fortitude to follow orders and stay true in the face of danger and almost certain death. MR. COTTON! Answer man!" Of course, being mute and not having a tongue makes it rather difficult for him to answer. Probably not a good start for Cotton, but he does prove himself as he stays on the crew for the rest of the series, always loyal to Jack. And then he meets Anamaria next, who of course slaps him. Will: "I suppose you didn't deserve that one either." Jack: "No, that one I deserved." She then rants on about how he stole her ship and how she needs it back. Jack then promises her another ship. She must have eventually gotten that ship because we don't see her on the crew past the first movie. Jack's crew also includes some other interesting characters like Joshamee Gibbs; his extremely loyal first mate. Gibbs sticks with Jack through out all the of his crazy escapades and leads the crew with a calm and steady hand. Plus his mutton chops rock! Also included in Jack's crew is Will Turner.